We recently looked back at all the reservations we had in 2018 and it was so exciting to see how many of you came to see us last year. We would like to say welcome to all of our 12,595 first-time guests in 2018 and happy anniversary and birthday to everyone who celebrated with us! At Mulino Italian Kitchen & Bar, we strive to bring you a dining experience like no other. We take the curious on a richly rewarding gastronomic journey across the Italian culinary landscape and reward the intrepid adventurer with simple yet sumptuous cuisine, wines, and a complementary culinary education in the history of Italian cuisine all in a very cozy environment. We serve local, seasonal, healthy, and versatile Italian cuisine – spanning many styles and iterations, including variations on the same dishes. With the little spicy pasta Arrabiatta versus Zingara or Putanesca here; and Amatriciana with Bucatini or with spaghetti there, Mulino serves dishes that span Italy’s vast culinary landscape and tastes. 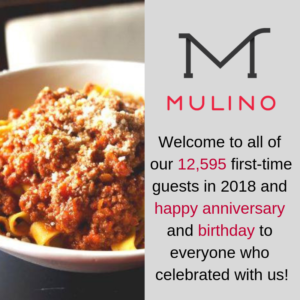 Whether you are looking for a Friday night spot to hang out with friends, a date night place for you and your significant other, a romantic restaurant to celebrate an anniversary, and everything in between – Mulino Italian Kitchen & Bar is your restaurant! We look forward to seeing you soon.